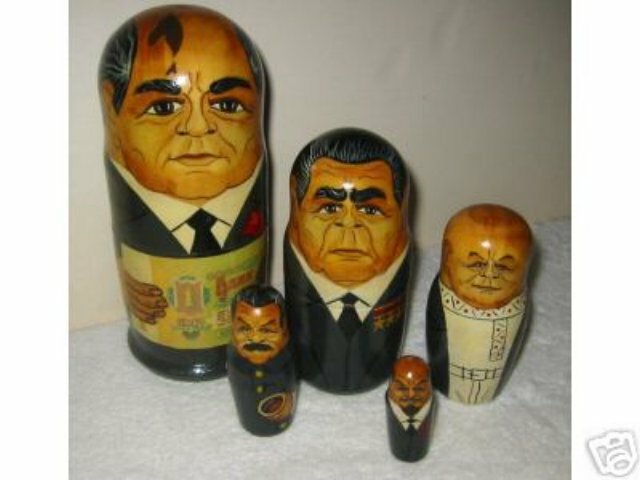 This 5-piece matryoshka begins with Gorbachev and goes down in size to Lenin himself. The largest figure is 7" tall. All features are finely detailed. It was purchased at Izmailova outside Moscow in 1995 and has been safely packed away since then. The dolls are Gorbachev (holding an actual Ruble note), Brezhnev (with military medals), Khruschev (wearing a Ukrainian peasant shirt), Stalin and Lenin. The faces on these dolls are very expertly done.